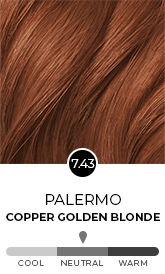 Paola is a Chestnut hair colour has a light brown base and rich, warm reddish brown reflects. Chestnut hair is truly multi-dimensional. Paola walks the line between copper and chocolate tones, for a finish which adds life and dimension to any hair style. 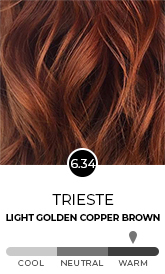 Tone: Warm undertones add Red and Gold reflects to the hair, which give another colour dimension and add warmth and vibrancy to your Hair. Warm reflects will give you either copper, red or golden undertones, depending on your colour choice, within the base colour which are typically more visible in direct or natural light. The Shade delivers a new, professional, easy to use home colouring experience that will leave your hair in better, healthier condition after colouring and with salon gorgeous natural-looking colour results.